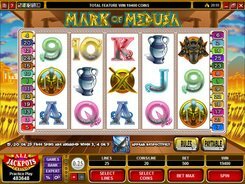 Mark of Medusa is a 5-reel 25-payline slot, which theme revolves around Greek mythology. On the reels, you will see mythological creatures such as Medusa, Pegasus and Cerberus. Other symbols are ancient vases, swords, Greek warriors and playing cards from Nine to Ace. By adjusting a coin size and the number of coins per line, a player can place a stake anywhere between $0.01 and $125. 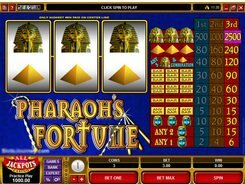 This betting range will definitely appeal to players on a budget and high-limit bettors. 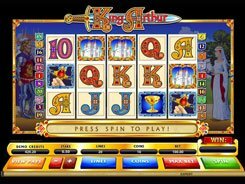 The game features a wild, a scatter and a massive $50,000 fixed jackpot. A wild represented by Medusa substitutes for other symbols and pays out the above mentioned jackpot for five of a kind. 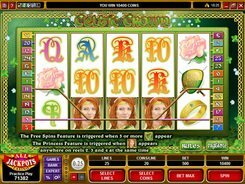 Pegasus is the scatter that activates 15, 20 and 25 retriggerable free spins if 3, 4 or 5 occur in any position. 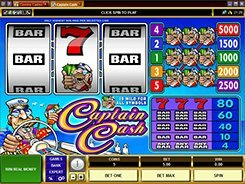 During the free spins all cash prizes are tripled. 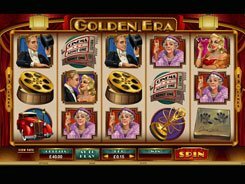 To sum up, Mark of Medusa is a well-balanced slot machine having a basic set of features you can expect to see in a 5-reel game. PLAY FOR REAL MONEY!